One of the more intriguing and influential artists of the Realist movement was Jean Charles Cazin. 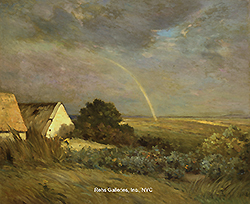 Although mainly thought of as a landscape artist, many of his early works focused on genre studies and/or interior scenes. Born in Samer in 1841 to Francois Joseph Cazin (a doctor) it was initially thought that Jean would also become a doctor, however as a young boy he displayed a talent for drawing and his parents helped nurture his gift. 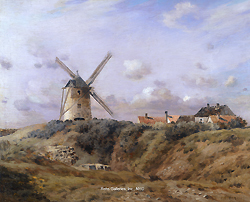 The family moved from Samer to Boulogne-sur-mer in 1846 so that their children could continue their education and it was here that Jean first me the Coquelin brothers. Jean finished his education in England and by 1863 was living in Paris. During this year he exhibited Souvenir des dunes de Wissant at the Salon des Refuses and enrolled in the Ecole Gratuite de Dessin, studying under Horace Lecoq de Boisbaudran. The 1860’s were an important period in Cazin’s development. It was at this time that he met Bonvin, Fantin-Latour, Legros, Ribot and L’hermitte and was recommended by Lecoq de Boisbaudran for a teaching position at the Ecole Speciale d’Architecture in Paris. He moved from Paris to Chailly, near Barbizon, and produced a series of landscapes that were accepted at the Salons of 1865 & 1866. Throughout this time he continued to receive the support of his professor and was nominated for the post of Director of the Ecole de Dessin and curator of the museum in Tours (the school at Tours trained many local artisans for the surrounding industries). Cazin reorganized the school according to his training with Lecoq de Boisbaudran and became interested in the industrial arts. In 1868 he married Marie Guillet, a student of Rosa Bonheur, who not only became a serious artist but also a ceramist. Cazin’s position as the curator of the local museum allowed him the opportunity to travel and study the collections from other villages and countries. By 1871 the ravages of the Franco-Prussian War and disagreements with members of the museums concerning his programs had forced him to move to England. It was here that his interest in ceramics flourished and he soon made arrangements with the Fulham Pottery to have artisans work for him so that he would have works to decorate. 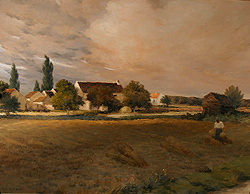 In 1875 Cazin returned to France, settling in the area around Boulonge, and began to paint again. In 1876 he submitted his first major work to the Salon, entitled The Boatyard, and continued to exhibit there through 1883, receiving a first class medal in 1880 and was awarded the Legion d’honneur in 1882. The late 1880’s saw a change in the French art community with the older artists cemented in the academic traditions and the younger artist following a freer expression of their talents. This divergence of ideas and styles led to the creation of the Société Nationale des Beaux-Arts in 1890 and Cazin was a founding member and would later become it’s Vice-president. In 1893 Cazin traveled to America and exhibit nearly 180 paintings at the American Art Galleries. The exhibit was in instant success and was reviewed in many publications. This exhibit not only displayed works from the artist’s collection, but many that were already in important American collections. 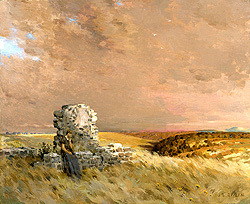 Demand for the artist’s work soared and his works soon found there way into even more American collections, including those being formed by Frick, Lockhart and Byers. 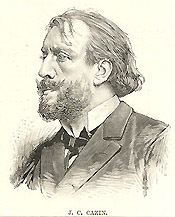 Cazin remained at the forefront of French landscape painting until his death in 1901. With M. Jean Charles Cazin we come to one of the most incontestable glories of contemporaneous French painting. I shall not be contradicted when I say that his landsca pes constitute the principa l attraction of our Decennial Exhibition…. 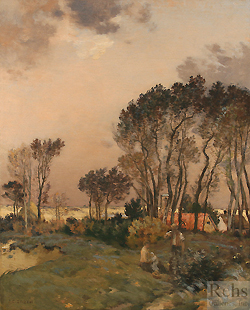 In the same manner, M. Jean Charles Cazin stands out among all contemporaneous French landscape-painters with all the grandeur of his genius. Charles Allis Art Museum, Milwaukee, WI. Frick Art & Historical Center, Pittsburgh, PA.
Weisberg, Gabriel P., Jean-Charles Cazin’s reception in America, Apollo: The International Magazine of the Arts, February 1999, pgs. 35-40. Weisberg, Gabriel P., Collecting in the Gilded Age: art patronage in Pittsburgh, 1890-1910, Frick Art & Historical Center, 1997. Weisberg, Gabriel P., Redefining Genre: French and American Painting, 1850-1900, The Trust for Museum Exhibitions, 1995, pgs.78-88.